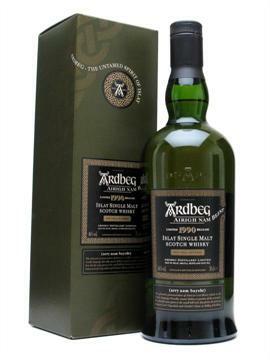 So, a short while back the nice folks over at Shoppers Vineyard put on this amazing sale which, as of today (March, 12, 2010) is still going on – 46% off of their price on Ardbeg’s “Airigh Nam Beist” 16yr old beauty!! Talk about a Sweet Sixteen!! Take that Molly Ringwald. You may never see a price like this again so my suggestion is to take advantage of it, while you can. Pronounciation — The Airigh Nam Beist is pronounced “Ari Nam Baysht” (which actually sounds Yiddish to me). Thankfully, the fine folks at Ardbeg decided to finally come out with products we all can pronounce: Rollercoaster and, umm, well that’s all of them I suppose (discounting the 10yr which was released years ago and we all can pronounce that one, right?). As winter is now winding down, my taste for the peatier malts is beginning to wane. So I wanted to get this review under my belt before the temps started hitting 70 deg F and the birds started chirping. Finish — Shorter than I expected (due to the 46%Abv? ), here comes the wood; now the beastie is showing it’s age (this baby is 16yrs old, BTW. It can start driving here in the US), lots of wood but not too-too much (like a good Chardonay — the crappy ones are over-oaked, the good ones are complimented by the oaky influence), lasting peat with a warmth similar to that of the Lagavulin 16yr. In sum — Wow. Astounding stuff. Alone, she shines like the morning sun. Next to other, more youthful Ardbegs, not so much… Drink her alone, this beast is a one guy gal (or a one gal gal). Don’t believe me? Check out Whisky Israel’s Corryvreckan vs Airigh Nam Beist review. Enjoy this one with your family during Thanksgiving dinner (for my US & Canadian readers)! Drinking this made me long for fun family times, roaring fires and relatives falling asleep due to high levels of turkey-induced tryptophan in their system. UPDATE – I’ve come to find out from a friend that these bottles could have 16, 17 or 18yr scotch depending on the code etched into the bottle. L6 = 16yrs, L7 = 17yrs & L8 = 18yrs old (or, another way of saying it is L6 was bottled in 2006, L7 in 2007 or L* was bottled in 2008 which makes this 1990 vintage 16, 17 or 18 years old). My Airigh Nam Beist is 18yrs old, not 16yrs. It make me want to try the 16 vs 17 vs 18yr old expressions. Anybody up for some sample trading?? Previous PostHighland Park 18yr – The best dram I’ve tasted in 2009!Next PostA productive next few days for whisk(e)y reviews!